Martha Long, author of the critically acclaimed ‘Ma…’ series, releases her debut fiction title, Run, Lily, Run, on October 23 this year. Lilly and Ceily Carney are only seven and twelve when their mother is cruelly taken from them, leaving them at the mercy of the Church and the authorities. This is a terrifying prospect in 1950s Dublin, where it is likely that the girls will end up in one of Ireland’s notorious Magdalen laundries – a fate they are determined to escape. When Father Flitters and the ‘Cruelty’ people arrive to take the children into care, Lilly and Ceily resist, and a riot breaks out. The girls are helped by kind Mister Mullins and his daughter Delia, but events lead to further tragedy and Lilly is left to fend for herself on the dangerous streets. Heartbroken, hungry and vulnerable, she looks like easy prey and it seems there will be no safe haven for her to find. Any further updates about Martha and her books will in future be posted to Facebook. All seven books in the Martha series now published. How many of them have you read? Martha has fans all around the world. Some of you have only read the first because it’s only been published in the US. Some of you came to it late so may have read a mixture. We’re keen to know that if you have bought one book as a result of seeing her on the Late Late would you go straight to the end or would you read all of them in order? Martha Long will be on the Late Late Show tonight. Stay with it. She’s on in part 4. For those of you in the UK you can try watching it on RTE player on your computer. For those of you in Ireland please let us know how it goes in case we can’t watch it! Thanks so much for all your help. The results were overwhelmingly in favour of an outdoor poster campaign in shopping centres throughout Ireland and RTE radio ads so we’re doing both. Please help us out by snapping photographs of any posters you see for the books and emailing them with details of where you saw them to Fiona.brownlee@mainstreampublishing.com so that we can post them on the Facebook page. Also let us know if you hear any of the radio ads plus the time and programme. Anyone who helps us out will be automatically entered to a competition to win a copy of the new book. The winner of the competition to win a copy of the new book is Linda Baker. A copy of the book will be mailed on publication day (12 September) please don’t post any spoilers for fans who haven’t yet bought it! Linda we hope you will make it either to the event in Dublin or London to get it signed by Martha in person. Please email your address to Fiona.brownlee@mainstreampublishing.com with the subject header Martha Long competition winner. Congratulations! We want your advice on how best to contact Martha fans who aren’t on Facebook. Can you let us know which of the following methods would be the best to let you know about the launch of the new book? Click on the poll below to answer questions. Anyone answering will be entered into a competition to win a copy of the final book in the series. Join us at the launch of the final book in the Ma series…. 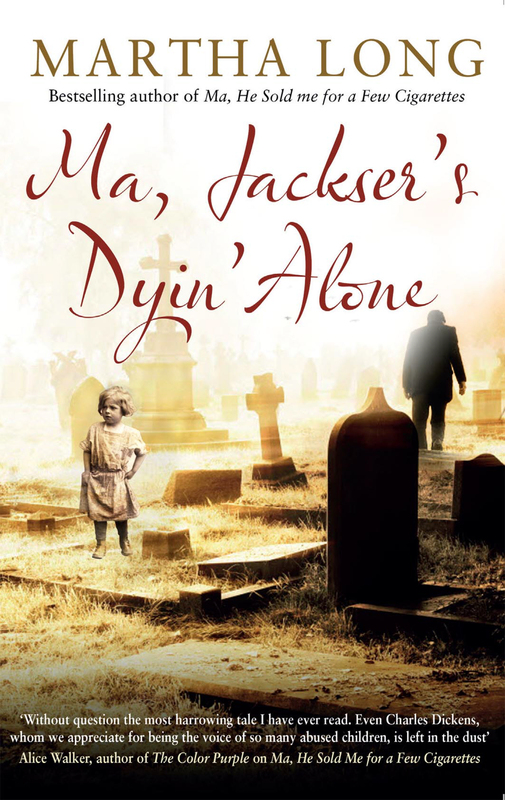 Ma, Jackser’s Dyin’ Alone will be launched in Dublin & London. Numbers are capped at 250 so book sooner rather than later. Thursday 26 September, Boogaloo, Archway Road, London (nearest tube Highgate). First come, first served so get there early. It is not a ticketed event. Doors open 7pm. Books will be on sale at both events. Martha will do a reading from the new book and will sign books afterwards.